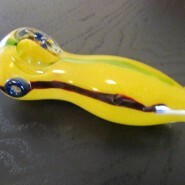 Home > Shop > Black and yellow glass smoking weed pipe style. Black and yellow glass smoking weed pipe style. NEW HANDMADE BLACK white and yellow color glass smoking pipe for weed 6" LONG FREE SHIPPING FREE smoking pipe screens. Great handmade glass smoking pipe black and white stars and moon like. made for the spirit of the holy pipe smoker here and all over the world. very light glass. made with care and love for the happy hippie pipes smoker. come and visit our great handmade glass pipes at the smoking pipe depot.